It has been an amazing few weeks for me. Since I last posted, I had the honor of welcoming my third child into my family. My newest daughter, nicknamed “Kitty Cat” for the sake of this blog, was 7 lbs 2 oz, and arrived October 2 after a much-too-short labor. She’s a sweet little one, and 8-year-old Raisin and 3-year-old Strawberry love her. It’s good Kitty is a good sport, given the number of hugs and kisses her siblings smother her with! I’m easing back in to blogging today with a simple fall project we did when Grandma was in town: we searched for favorite leaves and made rubbings! A nearby maple tree shed it’s super-sized leaves for us to enjoy, and it was fun to create leaf rubbings, a simple art project for all ages. 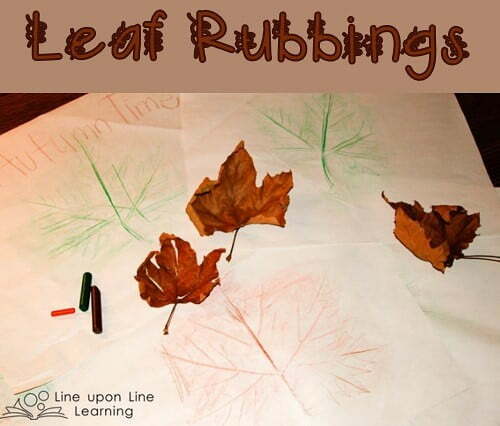 Leaf rubbings are simple. We used some butcher paper that I had from wrapping new dishes, old crayons that were missing their wrappers, and the leaves we found in our driveway. It took Raisin a few tries to learn to rub using the long edge of the crayon. We enjoyed watching the magic of the leaves appear on the paper. Strawberry liked mixing in new crayon colors to better represent the fall colors. We talked about the veins of the leaves, and we delighted in feeling the textures on the leaves after we’d rubbed them on paper. How have you celebrated autumn in your homeschool this year?